Dagmar's petition in March saw two new benches installed at the Victoria Street coach station - but she says it's not enough. A Northampton pensioner says she is "fed up" of the borough council dodging her calls to install benches inside the town's coach station bus shelters. 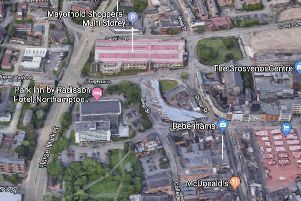 Dagmar King, 70, from Abington, is speaking at the full council meeting on July 10 to demand more places for her and her fellow passengers to sit out of the rain, as well as for some new toilets, at the Victoria Street coach station, off Upper Mounts. And after four months of calling and writing to the cabinet member for planning Tim Hadland, she says she will now give the council two weeks to respond to her speech before filing a complaint. Dagmar said: "I'm not asking for the world here. It's somewhere to sit out of the rain and somewhere to pee. We're human beings after all, we need these things. "It would be easy to add some sloping benches to the bus shelters. I've done my research and it would not be difficult at all. "When I challenged Tim Hadland about it, he asked me if I was an expert on benches. I've got a bad back and I need to sit down a lot, so yes, I think I'm a damn good expert on benches." In March, a 400-signature petition started by Dagmar swayed the council into placing two three-seat park benches along the Victoria Street coach station, off Upper Mounts. She said: "Those benches are fine if it's not raining and there are only six people. Those coaches hold up to 50 people at a time. Are we meant to queue up and take a ticket? "I've have been contacting the council since March. No one will get back to me and I am fed up with it. "I will not give up on this. It's like we won't blinking well matter, like we're too old to be bothered with." Councillor Tim Hadland, cabinet member for regeneration, enterprise and planning, said: “New and enhanced coach facilities will be introduced to the town as part of the upcoming Greyfriars development. Whilst this is being planned, we have been looking at ways to improve our current facilities, including the installation of two new benches at the site last March. A full Northampton Borough Council meeting will be held at the Guildhall at 6.30pm.